This beautifully restored colonial home is located one and a half blocks from the Jardín behind the Parroquia. It is the ultimate in San Miguel style and living Parts of this home were the first structures built on what is now known as Aldama Street. 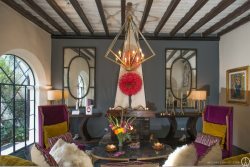 The home has been restored and decorated by one of San Miguel’s most respected design teams. It features antique furnishings, fabulous art and a premier location. This home offers three bedrooms and three bathrooms. The layout provides ample privacy for each bedroom and many design surprises. The master suite is on the main floor and has a king bed, fireplace, dressing area, and luxurious bath with separate tub and shower. The other two bedrooms are on the second level with a queen in one and twins in the other. These bedrooms may share a large European style bath which is on the same level or a third bath with shower which is on the main level. All bedrooms and bathrooms have magnificent linens and furnishings for the ultimate in comfort. In the back garden is a beautiful pool set against an historic rock wall. Comfortable lounge chairs are nestled around the pool for your enjoyment. A few steps below the pool are an outdoor kitchen with barbeque and a dining area for eight under a pergola. On the top level there is a casual outdoor patio for viewing the Parroquia and the surrounding Centro area. The staff is well trained and has a tradition of providing gracious hospitality to all visitors enjoying Casa San Andres. Please note to heat the pool is an extra cost to client. Please ask agent for pricing information.